Mexican movie director Guillermo del Toro is making a game with publisher THQ—according to del Toro, anyway—a project that we'll see next month when the "truly strange, geeky mix" of a horror game is revealed. 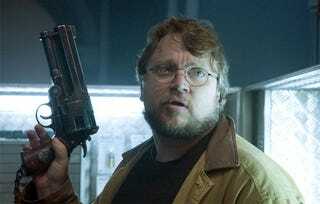 THQ's Danny Bilson reportedly let slip that Del Toro's project will be one of those games that gets screen time at the annual Spike TV Video Game Awards presentation. Joystiq reports that the title, developer and "all of that" will be revealed on Spike's game awards show. Del Toro describes his game to MTV Multiplayer last month, saying "It's... a very different type of horror game. It's not survival horror. It's truly a strange, geeky mix. It's a Lovecraftian thing. Let's leave it at that." The director of Hellboy and Pan's Labyrinth is currently attached to an adaptation of H.P. Lovecraft's At the Mountains of Madness.